There are thousands of articles on how to maintain personal sanity in the always-on work culture of today, but what about maintaining your digital dignity? 87% of employers rely on employees to use their personal smartphones for work purposes, and estimates show that we do just that roughly six hours per week, so we know that most people carry their work with them wherever they go. Our home and work life are now frequently shared on one device, which is both good and bad. You have a work computer of some sort, right? Be it a laptop, desktop, or tablet, you have a designated work space and a device to work on. You should complete as many tasks as possible on your designated work devices. This includes responding to emails, researching projects, and storing files. “Very funny,” you say to yourself, knowing that you respond to at least three emails every morning from your phone during your commute. It’s not easy, but you can streamline tasks like responding to emails and set aside time specifically for that job only. Android users can setup multiple profiles on their phone, allowing for complete separation of personal and work apps. At the end of the workday, simply switch over to your personal profile! iPhone users aren’t as lucky in this aspect, but bundling apps using iOS folders makes it easy to throw your work email, messaging apps, and needed software under one folder buried in one of your side screens. If there are certain people in your organization that you must respond to immediately, set up special VIP notifications on your iPhone or Android device. This way, the daily newsletter you don’t read won’t interrupt your morning, and the important proposal email from your boss will notify you the second it arrives. VIP status overrides all other settings, so you can disable every other kind of notification on your phone without fear of missing something that matters. Turn off all possible distractions and know that if your phone goes off, it’s something important and worthy of your attention! Utilize Do Not Disturb on your phone. With very few exceptions, any email sent at 11 PM can easily wait until 9 AM the next day. For that matter, if something can’t wait, the person that sent that email should be on your VIP list! Schedule these settings automatically, so they happen every day. On an iPhone, you can customize automatic DND to turn on at certain hours or even in certain locations. Android users can also customize DND to their liking. Automatic DND will allow you to sleep better at night and enjoy the moments that matter without disruption! Don’t text your boss - use email or your company’s preferred messaging system, like Slack. Don’t use that work messaging system to communicate with your family members. Keep separate parts of your life in separate apps! Intermingling apps and groups of people in your life can lead to big problems. What if your employer is involved in a legal dispute, and your phone becomes evidence? 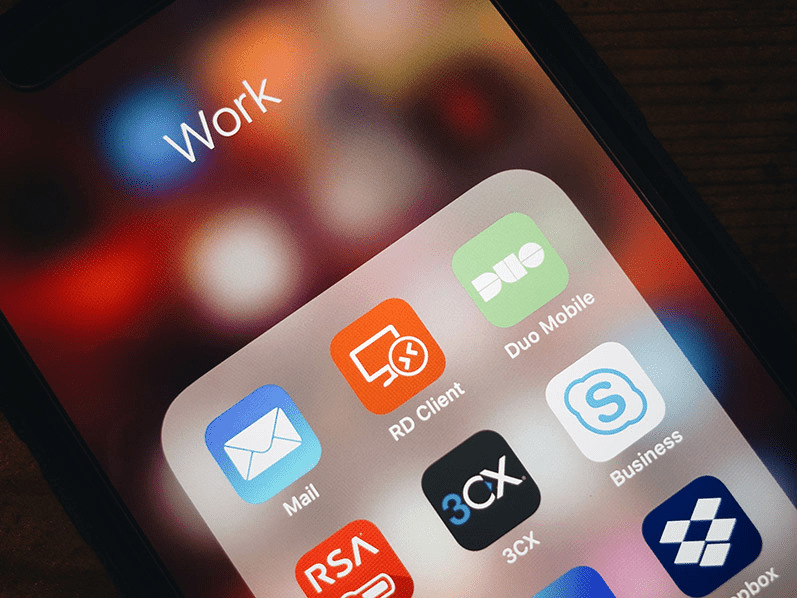 If your work communications are kept in specific apps, you won’t have to go through the embarrassment of having your personal life rifled through in search of evidence. Of course, this also helps your after-work sanity by making it easier to disable notifications in certain apps after work hours. If anything is that important after close of business, your co-workers will call you! Your phone is basically guaranteed to be involved in your work life. But, do you really need work files on your iPad? What about your home desktop? Keep work files contained to as few devices as possible. 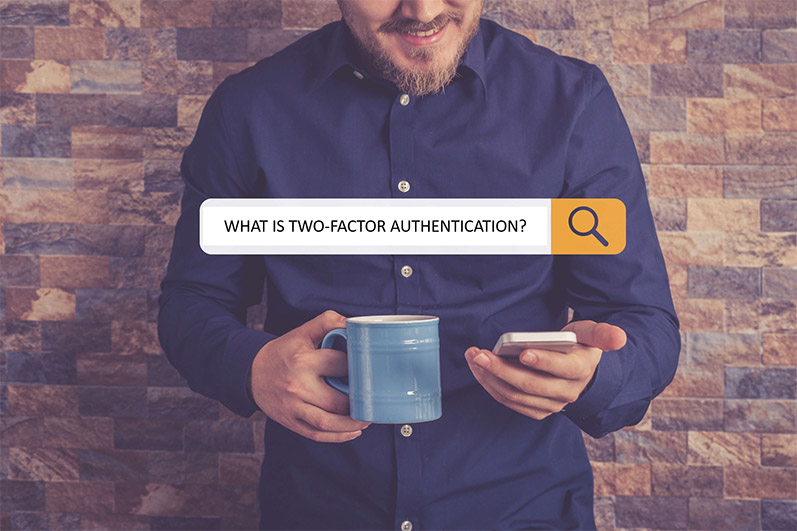 Just like above, if your company becomes involved in a legal dispute, your devices that contain work info will become part of the evidence log. The family iPad shouldn’t be part of a business court case! You should also have at least one personal device that is your own. You need to be able to unwind without being reminded of work tasks on every screen you see. As more and more people begin working remotely, we see the potential negative side effects of working everywhere, all the time. If you’re required to use your personal devices for work, you need to know your company’s BYOD policy. There should be clear and concise rules on what the company can see and what you need to do to keep your device BYOD-compliant. Things like required software updates, employee privacy, and what happens in the event of loss or theft should be covered in your company’s BYOD policy. Every business is different, but everyone should know what’s expected from their employer. What happens to your data when you leave the company? What exactly can your employer monitor on your devices? What types of devices are permitted? What ways are you allowed to share data? If your company doesn't have a BYOD policy - search out an IT consultant who can help you create one! 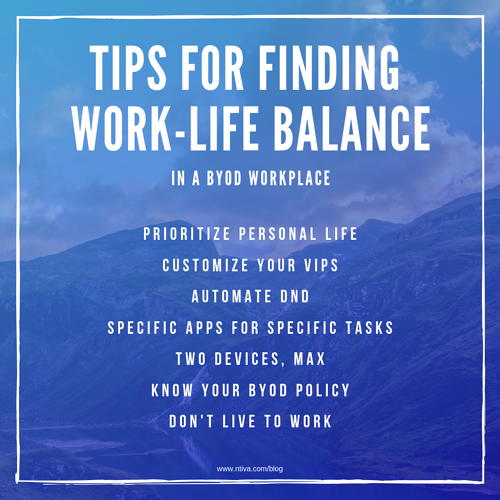 In today’s BYOD world, every device you own can deliver you work emails and spreadsheets night and day, but is it necessary? Compartmentalizing your digital life will help you and your employer. Your mental health is important. Your data privacy is also important. Both of these will improve with a few simple modifications to your every day. Take some time to separate your work from your personal life. Your family will be glad to see your face without a screen in front of it! Enjoy this article? Consider subscribing to The Ntiva Tech Corner blog to get regular updates.